The 747 is America's #1 stapler. This royal blue classic stapler features a metal cap and metal die-cast base for superior durability and stability. An inner rail for jam-resistant stability and long-term stapling integrity helps the royal blue 747 staple 2-20 sheets using S.F. 4 staples. A positive locking latch ensures the confidence and control of a secure stapling position. The 747 opens for tacking flexibility, too. Product number SWI-74724. Welcome to MyBinding video. 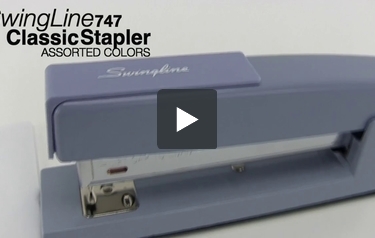 Let's have a look at Swingline's 747 Classis Stapler. I chose sky-blue for this demonstration but they come in black and white, burgundy, navy blue, lots of colors but it's still a stapler. This one, the 747 is the workhorse stapler that brings you solid and consistent performance that makes an industry standard. It easily punches through 20 sheets of 20 pound paper. It has an all-metal dye cast base for years of durability and a performance driven mechanism with an inner rail for long term staple integrity and open flat for tacking. There it is. That's the 747 classic by Swingline. For more demos, reviews and how to's, check out MyBinding.com.